Methylal, is a transparent liquid, used as a plasticizing agent for resins, and as fast evaporating solvents. Methylal also known as dimethoxymethane, produced by oxidizing methanol or through reaction of formaldehyde and methanol. 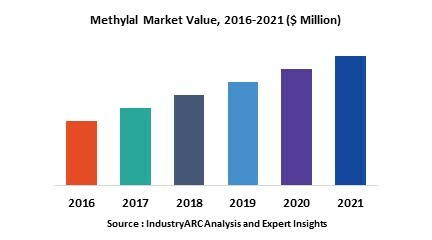 Globally, rising demand methylal as blowing agents for PU foams in South American countries and Asia Pacific countries, growing pharmaceuticals and paints and coatings industries, flourishing cosmetic industry, and advantageous properties of methylal such as, good solubility in water and other solvents, low boiling point. non-toxicity and anti-carcinogenic are the prime growth drivers of global methylal market. In addition, emergence of methylal as an automotive fuel and diesel modification additive, increase in adoption of methylal for application in newer industrial vertical, and emerging economies such as China, India and others, will create new opportunities for global methylal market. However, volatile prices and availability of raw materials, availability of substitute compounds, exposure to methylal can cause skin and eye irritation, along with nausea and dizzy headedness, and stringent government regulations are the key restraints for global methylal market. Geographically Asia Pacific dominated global methylal market, with China leading the production. North America and Europe’s methylal market is projected to have significant growth, owing to these regions cut back on VOC emissions. In addition demand for methylal from South American countries would increase, due to gradually phasing out HCFC under per the Montreal Protocol and higher adoption of methayl as a blowing agent. This report identifies the global methylal market size in for the year 2014-2016, and forecast of the same for year 2021. It also highlights the market drivers, restraints, growth indicators, challenges, and other key aspects with respect to global methylal market.